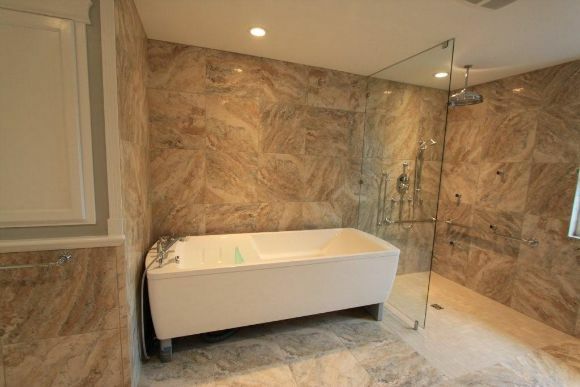 ​Bathrooms are the most common renovation project within Victoria BC. Contractor skills are worth validating to protect from the moisture and mildew challenges bathroom's pose. Enlarging this shared bathroom meant adding a wheel-in shower, a hydraulic tub, and tiled everything. It's style is modern and open. A modest wall hung basin attests to the owner's ability to live simply, while the glazed door adds a bit of excitement and all together it is just neat. Formaldehyde free bamboo cabinets and carpet made of corn, provided a healthy environment for this homeowner. Open ceiling approach lets in natural light to bathroom with new tiling and cabinetry to match the outdoor theme. Shining light on this renovation meant adding skylights along with a new glass shower, bath, and tiling. Maximize space and create an open feeling was the request. Walls were removed, wider window installed, and a see-through shower made the space comfortable. Re-done from scratch with an aqua theme and modern fixtures, bathroom was modernized. A newly renovated bathroom can add joy and serenity to your day. Clients work hard to find that perfect tile, that perfect shower head. They know that a rejuvenated bathroom can mean rejuvenation for them too. We love to work with you to find those perfect elements for your custom bathroom. Plus, we now offer West Coast theme bathrooms: Zen Retreat; Under Sea; White Skies, and Fresh Flare. These bathrooms, brought together in partnership with designer Daria Bunting offer excellent quality and lasting style at a reasonable cost. Whether you need to turn your stress into excitement and power for action; find direction by reflecting in seclusion, or rejuvenate with your own spa, we work with you to create your dream bathroom.